Today's Deseret News has an article about the Specialized warehouse grand opening I attended yesterday. It features a photo of the "Gold Medal Sprints" they had set up using track bikes on trainers. The credit in the caption has the names wrong [edit: online edition has been corrected], but long-time readers may recognize the face of the guy on the right. You may also recognize the Revolution-Peak Fasteners team kit. You look fast. I'll bet you're fast. 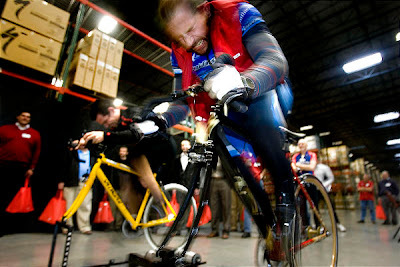 Speed is measured by in the intensity of the grimace. Rabid--being fast is one thing, but LOOKING fast is way more important. Thanks for the compliment. what, benicio del toro isn't a compliment? dug, I thought you were talking about the other guy in the photo. He really does look like BdT to me. was is it cold in there? I can't imagine putting in that kind of effort with a vest on INSIDE. Cool Pic. I shall call you "From the bull" from this point forward. I wish there was more snow!